Make Your Doctor's Visit Worthy! When you go to see a doctor, the visit seems to be over in a flash and you leave wondering what exactly your doctor wanted you to do. Most doctors are often busy and may tend to omit talking about health matters like diet, weight, exercise, sleep, smoking, vaccines and so on. Hence, if you feel like some general health issue may be relevant to you, make sure you discuss them with your doctor. Here's how to prepare your visit and feel confident about asking questions during your appointment. 1. Fix an early appointment - Scheduling an early appointment will ensure that you have some time to interact with the physician. 2. Prioritize your question list - Make a list of all the questions you may want to ask. Having a list of queries to ask and/or tell your doctor is critical for making sure you receive the best medical care. 3. Be specific - Don't just say you feel tired, explain exactly what it feels like. Describe your symptoms accurately to help your doctor best understand the problem and to proceed for the proper treatment or tests. 4. Stay focused - Listen to what your physician says. Try to interpret it. If you don't understand the technical language, make sure they slow down and explain what is necessary to make you understand the issue. 5. Know your medications - Check with your physician about your past medications (if any), current prescriptions, its side effects etc. 6. Build rapport - Your doctor cannot help you if you are not open and honest. 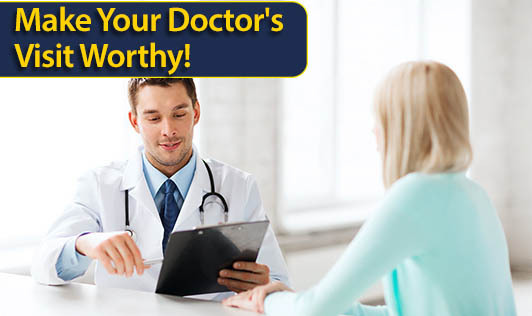 Tell your doctor everything he/she needs to know to give you the best care possible. This will also enable you to contact the doctor at anytime in case of any emergency. 7. Understand tests and diagnosis - If the doctor recommends a diagnostic test, understand the process, the outcome and the risks involved. Ask why the doctor is requesting the test and if there are less-expensive but equally effective alternatives. 8. Go with your family or friends - Let your family or friends listen to the same. This way you will have four ears listening to what the doctor has to say. 9. Respect the doctor's time - Arrive early to fill out any forms. Ask the most important questions first. Keep in mind that your physician doesn't have time to look at family photos, discuss your vacation or listen to long stories. 10. Don't be embarrassed - Don't be ashamed to discuss any sensitive topic with the doctor. You are your own advocate! Keep an ongoing record of advice and suggestions from your doctor as these can help you forever.